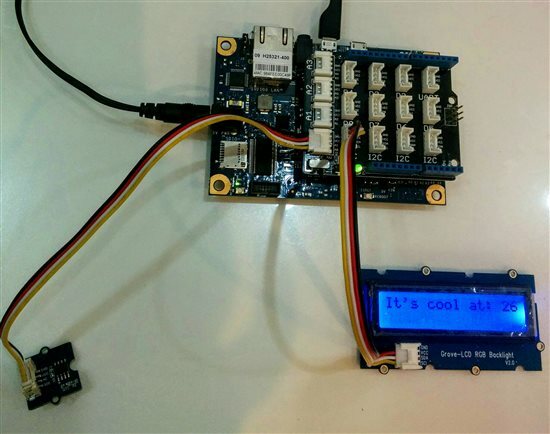 Wiki > TechNet Articles > Arduino: C++ - Room Temperature Detection with Galileo Gen 1 and Grove Kit. Arduino: C++ - Room Temperature Detection with Galileo Gen 1 and Grove Kit. 1. Temperature is less than 27 degrees. 2. Temperature is greater than or equal to 27 degrees. 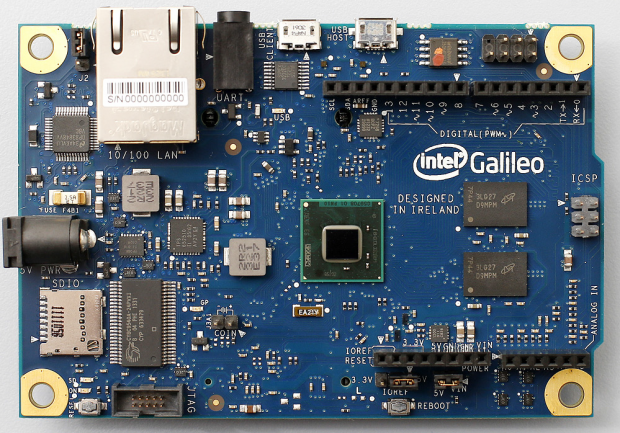 In this project, I'll be giving a brief about the Intel powered Galileo Gen 1 development board, the Grove Starter Kit and also on how to setup a simple Temperature Detection Project using the two. 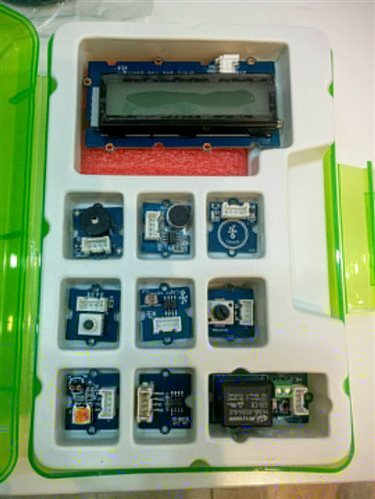 The Grove Starter Kit Plus IoT Edition of Grove System is a modular, safe and easy to use group of items that allow you to minimize the effort required to get started with microcontroller-based experimentation and learning. Although there are many choices available for microcontroller development environments. NOTE: This program works in conjunction with 2 files - rgb_lcd.cpp and rgb_lcd.h for controlling the RGB LCD display. We define 4 variables of type int: colorR, colorG, colorB and b & of type float: resistance, temperature. We then go to the method loop(), where we find another variable called val, that stores the pinTemp via the method analogRead(). After this, we calculate resistance and temperature, using simple existing formulas. Inside the loop, before displaying the temperature value, we set the color scheme that'll be visible based on the temperature, in our case it's "Below 27". With the print() method, value of the detected temperature as well as the corresponding message is displayed in Celsius. 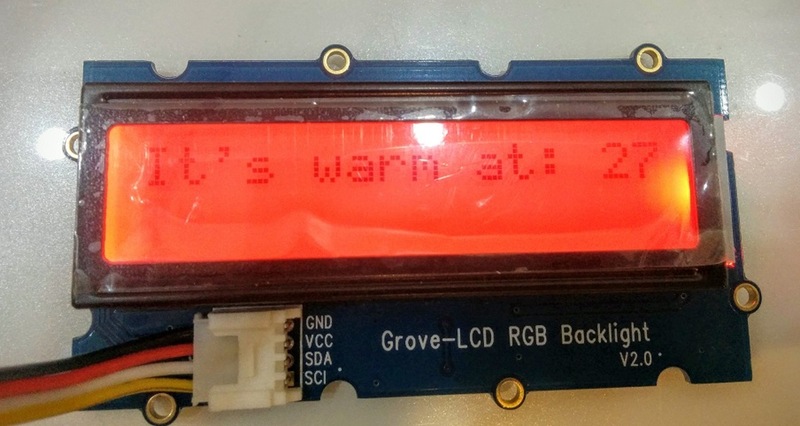 The interesting part comes now, with the lcd.clear() and delay() methods, as while the former eliminates all the content currently visible in the display, the delay() method ensures that after every 5 seconds interval it checks the temperature via the Sensor and displays it on the LCD. 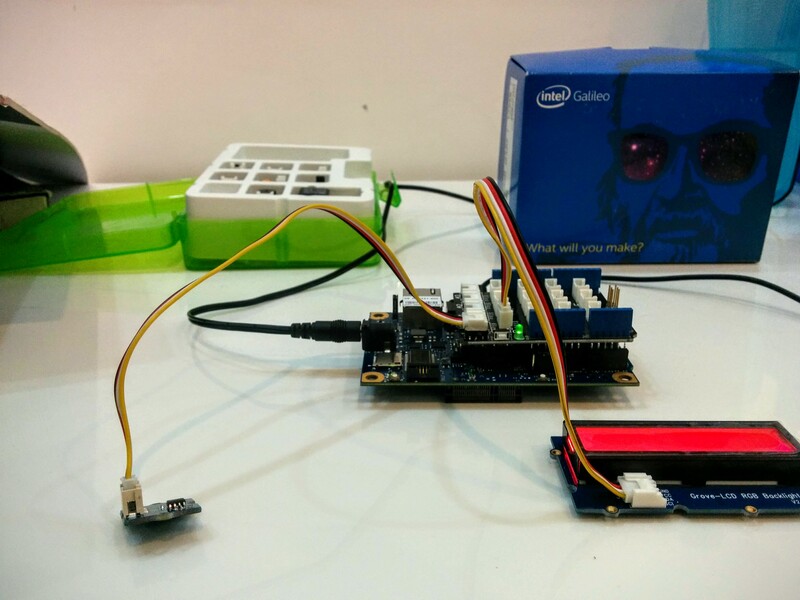 Start with downloading the Arduino IDE for Intel Galileo and the Temperature Sensor code from GitHub. 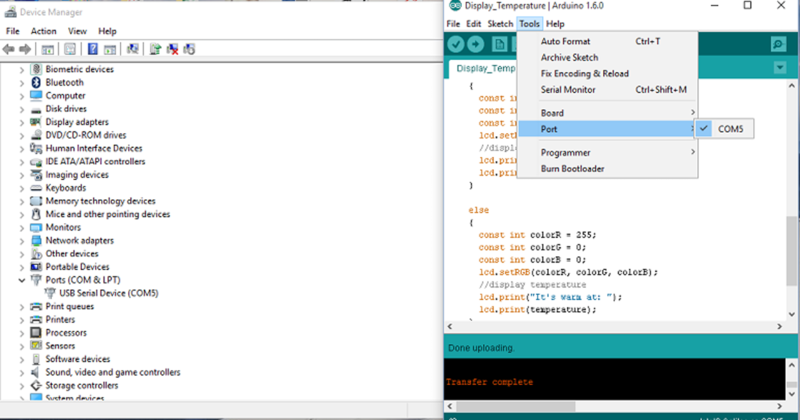 Transfer the .cpp and .h files into the Arduino folder -> Library folder -> Temperature_Sensor and save the .ino file into the same folder. 3) Once the code is uploaded, the LCD shows an initial purple light (because of color R, color G, and colorB being set at 255 each). In this article, we were able to create a simple yet effective environment sensor for detecting temperature, using just 4 components. For the curious ones, you can easily replace the Temperature sensor with a combined Humidity &Temperature sensor and hence detect and display 2 parameters instead of one, or simply change the color scheme to integrate even more varying temperature limits than just below 27 degrees.